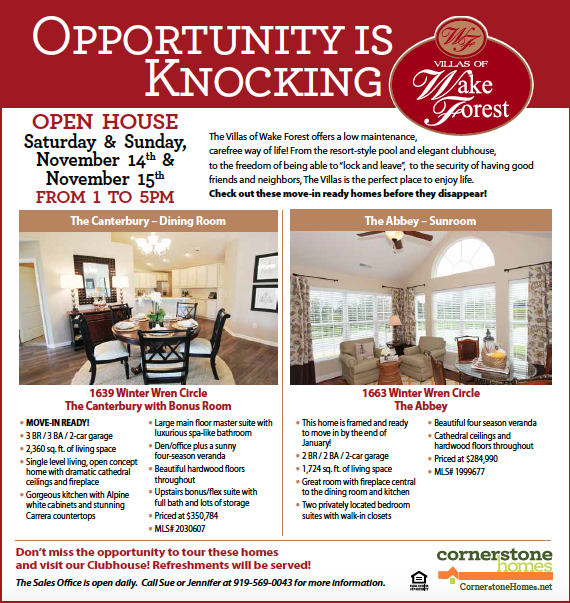 Open houses this weekend at The Villas of Wake Forest! Two new beautiful open houses to tour this weekend in The Villas of Wake Forest! Come on out to The Villas of Wake Forest to tour the NEW Canterbury and Abbey floorplans! Bonus: The Canterbury is MOVE-In READY! Both homes will be open on Saturday, November 14th & Sunday, November 15th from 1 to 5 p.m.!